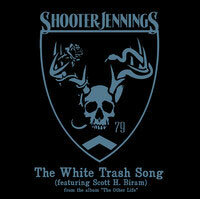 Shooter Jennings is the kind of guy that doesn’t take the easy road. He doesn’t just release a new album, he releases a concept album with a film tie-in. The few details around the concept taken from a the newly launched site from Neltner Creative states “The film explores the themes of self-discovery, temptation, isolation and rebirth and serves as a visual counterpart to the album.” Not the recipe for pop-country confectionery singles ready for rotation between Jason Aldean and Taylor Swift. The first cut of the album is a rocking country blues number entitled “White Trash Song” featuring Texas’ own Scott H. Biram. The song begins with a serene setting of birds chirping, a rooster crowing and a modern day hillbilly taking stock of his physical and mental landscape. Things rev up considerably and break into some sweet pedal steel, fiddle and piano turns. Biram shines in his introduced part with his signature gritty whoop and holler.